Nazareth Illit (Ebreu: נָצְרַת עִלִּית‬) (Upper Nazareth) is a ceety in the North Destrict o Israel. At the end o 2007 it haed a population o 40,800. Nazareth Illit wis foondit in the 1950s. Foondations wur laid in 1954 an first residents muivit in twa years later. It wis planned as a Jewish toun alangside the predominantly Arab ceety o Nazareth. The establishment o Nazareth Illit wis conceived in the early 1950s when development touns such as Karmiel an Beit She'an wur foondit. There were economic an security reasons for developin a toun in this region, but accordin tae Shimon Landman, director o the Interior Meenistry's Depairtment o Minorities, the municipal elections in 1954, in which the Israel communist pairty Maki became the lairgest faction, wur a source of concern. A parcel o 1,200 dunams o land, aboot hauf athin the municipal bundaries, wis expropriatit in 1954, relyin on a law that permitted expropriations for public purposes. Protests at this action reached the Supreme Court o Israel, which in 1955 acceptit (HCJ 30/55) the govrenment's wird that the sole purpose o the land wis tae erect govrenment facilities. Housomeivver, it haed awready been decidit that anerlie 109 dunams wad be uised for that purpose an plannin for residential neighborhuids continued. The first dwellins wur completit in September 1956 an the first residents muivit in later that year. Accordin tae historian Geremy Forman, an important aim o Upper Nazareth wis tae ensur Jewish sovereignty in the region. The director o the IDF Planning Department, Yuval Ne'eman, statit that the new toun wad "safeguard the Jewish character o the Galilee as a whole, an... demonstrate state sovereignty tae the Arab population mair than ony ither settlement operation." Forman wrote that Upper Nazareth wis meant tae address the challenge perceived as emanatin frae the aw-Arab ceety o Nazareth, an the goal wis tae build a neighborhuid that wad owerpouer Nazareth numerically, economically, an poleetically. 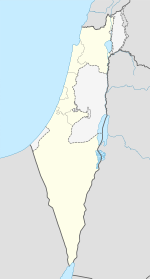 Initially the settlement wis referred tae as the "Jewish neighborhuid" o Nazareth, then as Kiryat Natzeret. The name Nazareth Illit wis adoptit in 1958. In 1960 the pairt athin the municipal bundaries o Nazareth wis excised frae Nazareth, an the follaein year Nazareth Illit wis endowed wi the municipal status o local cooncil. Accordin tae CBS, in 2001 the ethnic an releegious makeup o the ceety wis 91.0% Jewish an ither non-Arabs, 9.0% Arab (2.3% Muslim an 6.7% Christian). In 2001 there wur 655 immigrants. See Population groups in Israel. Accordin tae CBS, in 2001 there wur 21,000 males an 23,200 females. The population o the ceety wis spread oot wi 27.5% 19 years o age or younger, 14.8% atween 20 an 29, 18.6% atween 30 an 44, 18.7% frae 45 tae 59, 5.3% frae 60 tae 64, an 15.2% 65 years o age or aulder. The population growth rate in 2001 wis -0.4%. Accordin tae CBS, as o 2000, in the ceety there wur 17,229 salaried wirkers an 764 are sel-employed. The mean monthly wage in 2000 for a salaried wirker in the ceety is ILS 4,377, a real chynge of 6.4% ower the course o 2000. Salaried males hae a mean monthly wage o ILS 5,373 (a real chynge o 8.2%) versus ILS 3,388 for females (a real chynge o 3.9%). The mean income for the sel-employed is 6,646. There are 1,337 fowk who receive unemployment benefits an 5,532 fowk who receive an income guarantee. Accordin tae CBS, there are 15 schuils an 6,138 students in the ceety. They are spread oot as 12 elementary schuils an 3,042 elementary schuil students, an 5 heich schuils an 3,096 heich schuil students. 56.8% o 12t grade students wur entitled tae a matriculation certificate in 2001. Hapoel Nazareth Illit is the ceety's major fitbaa team. Haein been promotit tae the top diveesion for the first time in 2003, the club wis later relegatit in 2006 tae Liga Leumit, the seicont tier, whaur they currently play. The ceety an aa hostit several Bnei Sakhnin gemmes durin 2005 an 2006 as Sakhnin's Doha Stadium did no meet the Israeli Premier League requirements at the time. The city's basketball team, Hapoel Nazareth Illit is playing in the Second division Liga Leumit. ↑ "Table 3 – Population of Localities Numbering Above 2,000 Residents and Other Rural Population" (PDF). Israel Central Bureau of Statistics. 2010-06-30. Retrieved 2010-10-31. ↑ G. Forman: Military Rule, Political Manipulation, and Jewish Settlement: Israeli Mechanisms for Controlling Nazareth in the 1950s, The Journal of Israeli History, Vol. 25, No. 2 (2006) 335-359. Wikimedia Commons haes media relatit tae Nazareth Illit. This page wis last eeditit on 5 Mairch 2018, at 07:35.